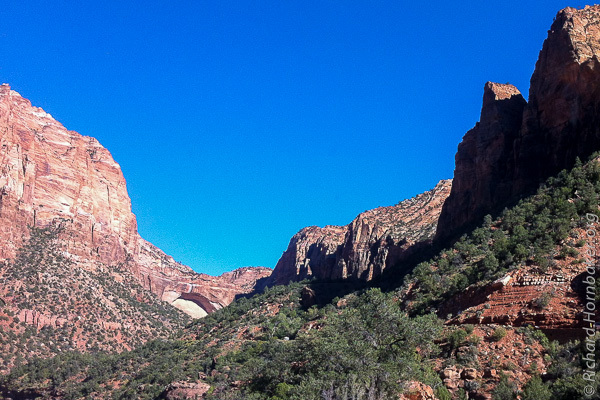 So far this trip we had a trend of grand landscapes – mountain ranges, canyons, etc. Now, we were shifting gears, and the adventure really began. We were venturing “off the map” – away from designated landmarks and toward discoveries of our own. We decided to head East into Colorado, and for the first time we didn’t really have a destination in mind. Instead, we had a theme – fall foliage. On an idea, I’d found an article in one of the Colorado papers from a couple weeks prior. It listed a bunch of places to see fall colors, and estimated the leaves would be turning right about now. It seemed our timing was accidentally perfect. Taking pointers from the article, I mapped out a dozen sites in Google Maps and started to piece together a route from Moab. A bunch of sites got cut from our list because they were too far out of the way, or only accessible via long dirt roads. But even the shortened list was a pretty good selection. The storm that’s crossing the central US is starting to roll in, but so far we’re still ahead of it by about a day. We have no idea where we’ll stop for the night, but we’re trying to avoid ending the day in any of the many ski resort towns – there’s no sense in over-paying for our room. Our course would take us diagonally to the Southeast toward the middle of the state, passing first through Grand Mesa, the connecting with a highway that’d take us back Northeast in a zig-zag pattern across the state. Heading toward Grand Mesa we had our first near-miss with wildlife. OK, well it wasn’t really a near-miss… we had plenty of room to brake, but suddenly an 8-point buck was sauntering across the highway right in front of us! Big guy, too. We’d been debating for days whether to get a GoPro Hero3 video camera for the dashboard – at this point, we regretted not having it. As we got to Grand Mesa, a dark storm was rolling over the peaks. It added a great dramatic element to the photos, but it also made the light challenging. The above image is an HDR comprised of 5 shots at 1/3-stop increments. It’s actually very close to the primary frame in the set – partly because my tastes in HDR are very conservative, but also because I applied strong graduated neutral-density (GND) filters to darken the sky when the images were shot. As the trip wore on, I came to prefer a soft-edge GND between 3 and 5 stops (0.9 to 1.5), which was achieved by using an 0.9 GND and adding a second 0.3 or 0.6 GND. As I work more with Nik’s HDR Efex Pro 2, I’m continuing to refine my custom presets. In the image above, I moved my post-HDR tone-curve tweaks from Lightroom into an HDR preset, which both reduced the number of steps in my workflow and improved my consistency. I really, really wish I’d shot this image as a stitched panorama to yield super high resolution. But as it was, we barely got to make our shots before the rain came down. It’s said that “luck is preparation meeting opportunity”, and this is a perfect example. As we were nearing a junction in the road, my colleague pulled over to take a phone call. I literally shot this next image handheld out the car window, using the doorframe as my stabilizer. Of course, I did still have GND filters on the front of my lens. All this goes to prove that good weather is boring, and foul weather makes for great images – you just have to endure it. Well, it’s not as if a change of plans was unexpected. We really had just a rough idea what we wanted to do, and we were improvising one step at a time. The idea for today was to make it back up to the top of the state, near the main freeway, before heading southeast through Aspen the next day. However, the day got long and we found ourselves about halfway along that route, in the town of Paonia. McClure Pass was next on our list and just up the road, but there wasn’t going to be much light left. 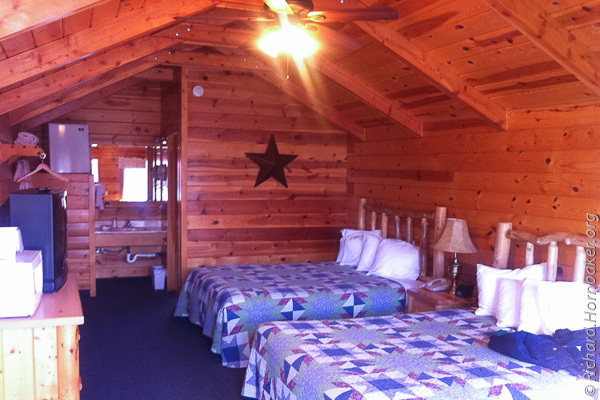 We checked rates and found it cost half as much to stay where we were for the night. 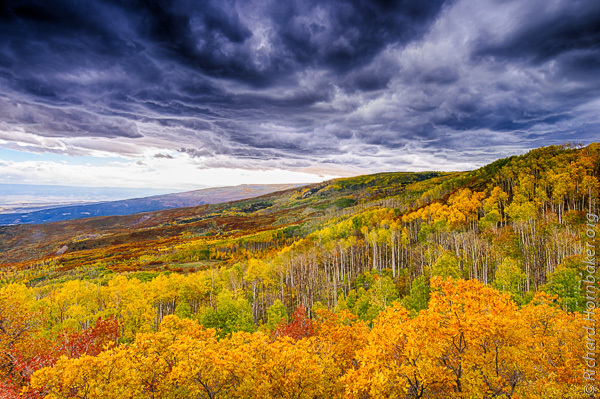 So, we’d spend the next day at McClure Pass, and then head through Aspen. The only challenge: the storm was going to hit overnight, so the weather might be pretty bleak, and the foliage might be hidden beneath snow. After Aspen, we’d try to make it to Colorado Springs by nightfall. 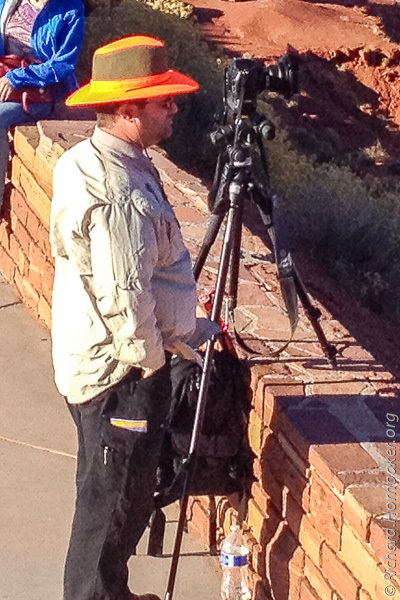 There we’d find the Garden of the Gods park. And maybe some train scenery. Perhaps even a drive to the top of Pike’s Peak. 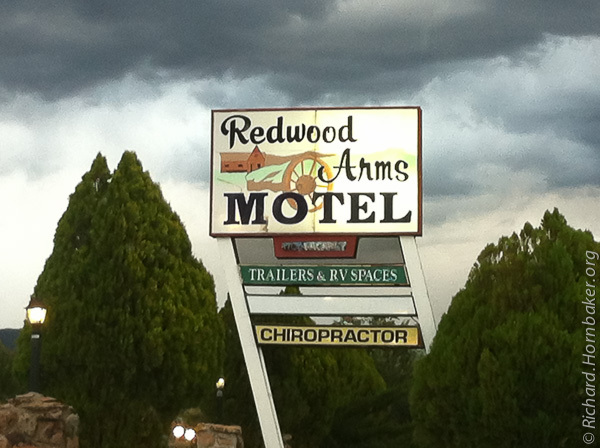 Fortunately, the only motel in the area was not only a reasonable price, but pleasant too. It’s a family operation, run by a charming little Polish lady. We’d been fortunate to land in their off-season – after July, but before the ski resorts opened. But even more surprising was the Italian restaurant where we had dinner in Paonia. 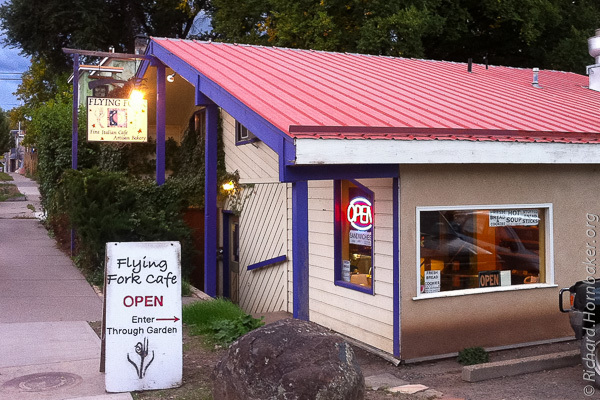 At the rear of the very unassuming Flying Fork Bakery is a garden, through which we entered the Flying Fork Cafe. This place truly is a gem – it could easily have been a high-end boutique restaurant in a major city, but instead it was hidden away in this little town deep in Colorado. My colleague is a bit of a foodie and he travels regularly to Italy, and he was pretty darned impressed by the place. Needless to say, it’s highly recommended. We got a good night’s sleep and started the day late. Checking the news, it was obvious the parks closure wasn’t ending soon. We ate breakfast at a local pancake house for the second day in a row, enjoying a mix of carbs and protein to fuel the day. A bit of work was done on photo editing and we debated a list of things to photograph that would let us salvage our trip and the time off. Fortunately, we hadn’t booked hotels further along our route – it looked like we were not only re-routing, but cutting a week off our itinerary too. We toyed with the idea of continuing up to Wyoming anyway – surely the Tetons could be photographed from outside the park. And Yellowstone had roads running through it, so perhaps it wouldn’t be completely closed. And the hotel had plenty of vacancy last we checked. Those ideas got cut short by a tropical storm that had hit the Pacific Northwest and was working its way across the central US, dumping heavy snow right where we planned to go, and spinning up tornadoes along our return path. Plus, the hotel was now nearly full from campers who’d been kicked out of the parks. We took the hint and scratched the northern two-thirds of our itinerary permanently off the list. Plus, we’d already paid for the night, so what could we do as an out-and-back day trip? The answer: Monument Valley. 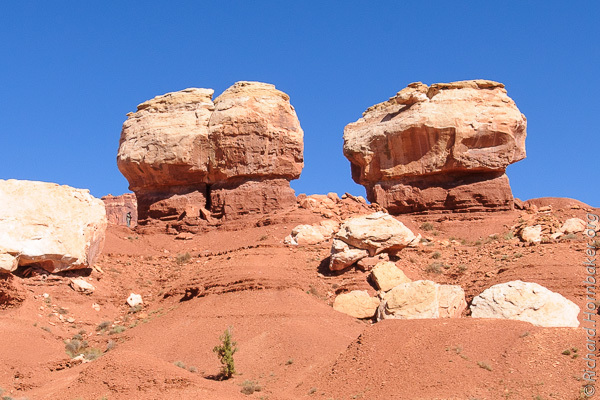 About 3 hours’ drive to the South and West from Moab, Monument Valley isn’t a national park – it’s on the Navajo indian reservation. It was on our itinerary originally, en route from Zion National Park to Canyonlands, but we’d removed it because it added like 6 hours of driving; under the circumstances, the extra drive wasn’t a big deal now. We decided to set out, with a goal of shooting at sunset. The road from Moab to Monument Valley is lightly traveled, so cresting a hill we couldn’t help but notice several cars pulled off the road. 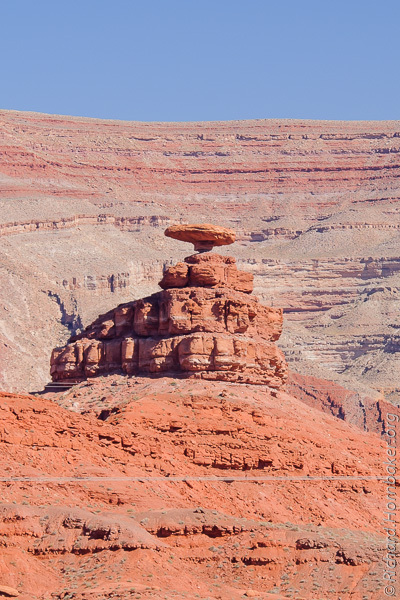 We’d stumbled upon a nondescript but interesting rock formation known as Mexican Hat Rock – no fanfare, just a street sign. This image demonstrates something I found pretty frustrating for the length of our trip – power lines. They mar beautiful landscapes, and Photoshop isn’t much help. Quite a bit of retouching with the famed Content-Aware Fill just couldn’t yield normal-looking results; in the end, I gave up and left them as-is. Before taking this shot, I actually hiked up and down the road to find a better angle to eliminate the power lines. Had I known they couldn’t be easily removed in Photoshop, I would have hiked in past the power lines and accepted a different composition. Mind you, I don’t have an issue with the need for power to cross these beautiful landscapes, but it seems that the paths they’ve chosen are frequently poor. Lines cut across amazing vistas when they could have been routed slightly differently and preserved a fantastic view. Editing this photo, I was reminded of an idea to eliminate these kinds of foreground objects – shoot from two slightly different vantage points, so the foreground objects fall in different spots of the composition. “Abusing” panorama software to align the two images, I’m thinking the content from one could then be easily cloned onto the other to paint over foreground objects, making them disappear. I didn’t shoot material to try that technique here, but it’s on my to-do list now. We arrived at Monument Valley in mid-afternoon, about 3 hours before sunset. The first thing to note is that the valley is full of Goliath-sized monuments, not just the iconic pair you see most often. Given the timing, there was a choice to be made – cruise around and look for interesting angles to shoot, or stake out a vantage point and wait for the sunset lighting to cast dramatic shadows across the valley. There’s a dirt road circling the main monuments, so a lot of angles are possible; however, we were driving a low-clearance car that didn’t exactly fit with the notion of “off-road”. We opted to pay our admission and setup camp at the visitor’s center, which incidentally has an excellent display of history on the Navajo’s critical role as code-talkers for the US military during World War II. Yes, instead of doing something unique, I wanted to shoot a cliché photo – and from the visitor’s center, no less. It sounds pretty lame, but the visitor’s center offered an excellent vantage point of the two extremely-popular “mittens”. I had an idea of the shot I wanted, which would be in the last minutes of sunset as the shadows grew long. This also meant that I was only getting one photo out of the entire day’s trip, so I was going to invest the effort to get it. Three hours early, we setup our cameras to stake out our spots, meanwhile drawing curious looks and questions from other tourists because of our camera rigs – most notably, the 6×7″ graduated ND filters fastened to the front. A drawback to setting up so early: someone’s got to watch your gear when you need to run to the bathroom. That’s when it’s nice to have a shooting buddy. You’ll notice my camera bag is clipped to the bottom of my tripod – this serves two purposes: first, it adds stability and lowers the center of gravity, reducing vibration and the chance of knocking the tripod off a cliff; second, in high-traffic areas, it straps everything together, making it extremely unwieldy if someone had ideas of stealing something. These first two shots are for comparison to show how the color of the light shifts to become “warmer” as the sun reaches the horizon – this is the so-called Golden Hour, and it’s a good reason to bring a tripod. To benefit from this effect, you wouldn’t want to shoot a color calibration card in this light – that’d negate the orange color shift. Instead, you’d shoot a color reference when the sun was high in the sky, and use the same value for all the shots (these are both set to 5500K). Both of these shots have roughly the same exposure, but you can see how the color is very different in the shot just before sunset; the other was taken 90 minutes earlier. I took a different approach for this shoot and captured a *lot* of images. I expected to post-process it in HDR, and possibly even composite images from different times during the sunset. I set the camera to bracket 9 shots at 1/3-stop intervals, so I’d be able to draw out the shadow detail without it looking extreme. Primary exposure was slightly under-exposed for the directly-lit monuments, with bracketing ranging from 1-1/3 stops brighter to 1-1/3 stops darker. There weren’t clouds or other objects being overexposed, and I used a 2-stop (0.6) graduated neutral-density filter to darken the sky to about the same exposure as the subject. So, I didn’t bracket to recover highlights, I did it to add detail to the shadows in the foreground. As the lighting changed, I adjusted the shutter speed to maintain about the same exposure on the monuments. Adding to the HDR, I used an interval timer to fire a bracketed burst every 20 minutes at first, progressively shortening it to every 15 seconds at the end of sunset when things change quickly – and, yes, I ended up with a ton of shots. To make this work, the camera is set for continuous high-speed shutter – on a Nikon, if you hold the shutter release to fire continuously during bracket mode, the camera will automatically stop shooting when the last shot of the bracket has been taken. Using this behavior, the interval timer was set to do a bulb exposure (i.e., hold the shutter release down) for several seconds. I also use this technique without the timer, because it’s much easier than remembering how many shots of a bracket have been fired. The final image was processed first in Lightroom as a bracket of 9 shots from 10 minutes before sunset. Those shots were then merged to HDR (and tweaked some more) using custom settings in Nik’s HDR Efex Pro 2. The final image was auto-imported back into Lightroom where a few more adjustments and cropping were done. I’m pretty pleased with the end result, which doesn’t look artificially HDR to me, but conveys a wide range of lighting. The drive back to Moab was uneventful, but very dark and solitary with no other cars for miles at a time. In the middle of nowhere, we stopped at an A&W restaurant and bowling alley (!) at a gas stop. They’d just closed for the night, so we bought up the only thing they had left: some very greasy fried chicken that’d been under a heat lamp most of the night. Opinions were mixed on whether we would have been better off to go hungry for another hour. Yep, it happened. It’s October 1, 2013, and the new US federal budget didn’t get approved. In the most visible immediate impact, all national parks were closed. Apparently roads, overlooks, and campgrounds stop working without funding. I’ll spare you a political rant, but I’ve been incredibly frustrated by the lack of common sense being applied – this almost seems designed to make the public irate. In many cases, more effort was being spent to deny access than just to allow it to continue. E.g., barricading and patrolling open-air monuments and memorials. Locking rest stop toilets that are literally nothing more than a toilet seat over a large hole in the ground. Among the petty actions, the National Park Service even took down its website, claiming it “wasn’t being maintained”. Anyway… we decided to hang out in the motel for the morning in case the politicians came to an agreement and the disruption was short-lived. As the day wore on, it became evident that we needed to make other plans. And so did other folks – by mid-morning, the area was already losing massive amounts of business; one hotel had 3 tour buses cancel immediately, costing 50% of their bookings. We took the opposite approach and extended our stay by an extra night, holding onto hope that sanity would prevail and we could resume our itinerary. Meanwhile, we considered other activities for the next couple days. 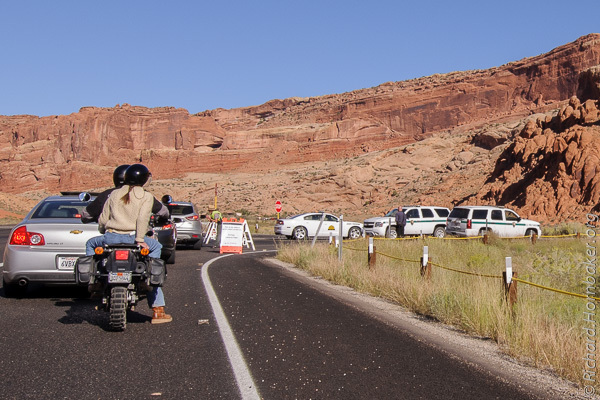 As luck would have it, we’d passed a turnoff on the road to Canyonlands. 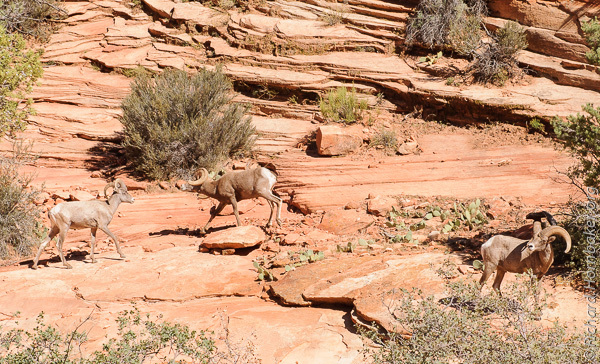 It was for one of Utah’s state-run parks, and it had an entirely different vista of the canyons below – essentially, it overlooked the upper section. And, boy, were they busy. By some accounts, they had 10 times their normal volume of visitors. I’m sure this was greatly influenced by their proximity to both the town of Moab and two major national parks. After a light breakfast in the motel lobby, we’re back on the road. 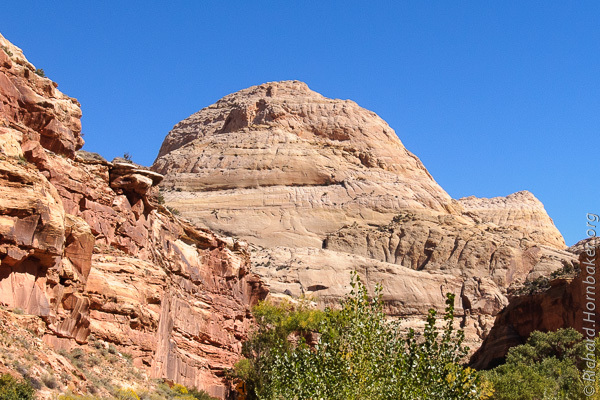 Capitol Reef kept coming up as a notable place to visit, so we mapped a route through it on the way to Canyonlands. It’d only cost us about 90 minutes, plus we’d started to wonder how many national parks we could hit in one road trip. 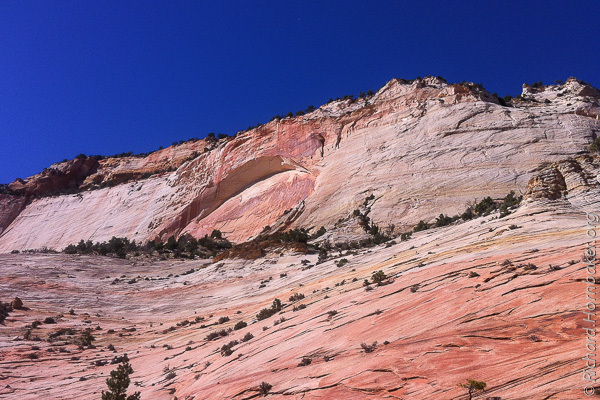 Near the entrance, it wasn’t obvious how Capitol Reef got its name, but we were fascinated by the contrast in rocks. A deep red base topped by very white boulders. 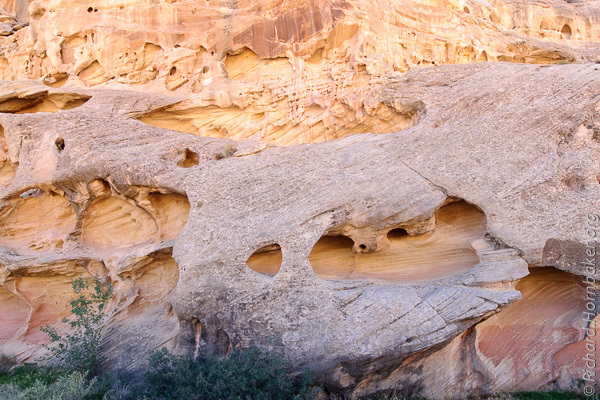 A bit further, and the “Reef” part of the name starts to make sense – the canyon walls look like Swiss cheese. We reached Canyonlands later in the day, and sunset was approaching by the time we reached the furthest observation point. There were several observation areas along the way, but I think the point at the end of the road gave the best view by far. An easy half-mile hike from the main viewing platform was a less obstructed view with a nice panorama of the valley below, and the canyons beneath. It was about an hour before dusk, and the shadows were starting to grow longer (and also add some depth to the landscape). I doubt this vantage point would be good at sunrise; not only would you be shooting toward the sun, but a lot of the shadows would fall where you couldn’t see them. We slept in a little, then hit the visitor’s center on our way out. Our route was back out the North-East entrance of the park, through Kanab, Utah. Clouds had rolled in, so we stopped strategically to take a handful of retakes, killing about an hour along the way. What a difference it made to have clouds in the sky! 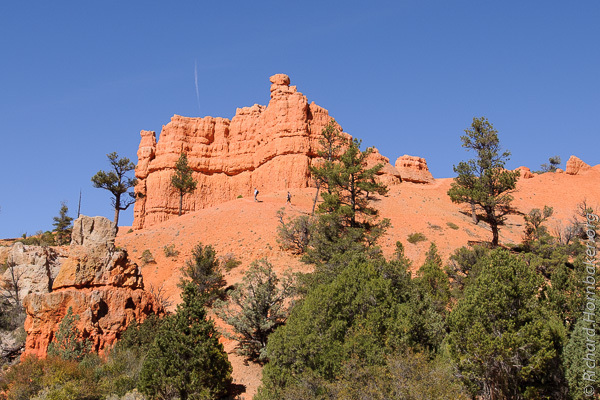 Along the route from Zion to Bryce Canyon is Red Canyon, part of Dixie National Forest. It’s a small place, but colorful. 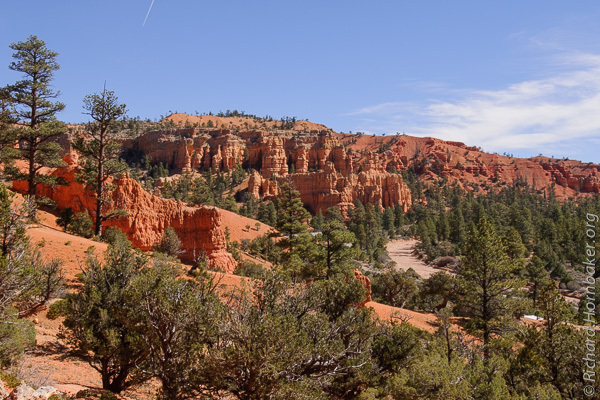 Red Canyon’s soil is a dark red like Sedona, AZ, which makes for a very picturesque contrast with the green foliage and blue skies – especially if it’s lightly cloudy. 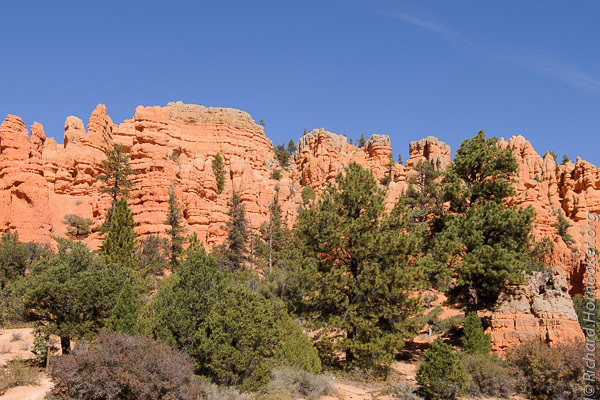 Just inside the entrance to Red Canyon is a feature with short trails to photo vantage points and great panoramic vistas. We arrived at Bryce Canyon around 2:00, stopped by the visitor’s center for some guidance and souvenirs, then went straight out to start shooting. We worked our way down all of the observation points and trails, managing to hit the last one well before sunset. But where it had been around 70 degrees in Zion, it was closer to 40 in Bryce – when the sun was behind the clouds, I really felt it! The weather was lightly cloudy, transitioning to mostly cloudy as the day wore on; at times we’d lose our light, but within a few minutes we’d have a handful of seconds to shoot with hard light. So, it took some observation, patience, and preparedness to get the shots in. There was still enough light to shoot when the sun was behind clouds, but the light became so soft that a lot of the definition in the rocks was lost. 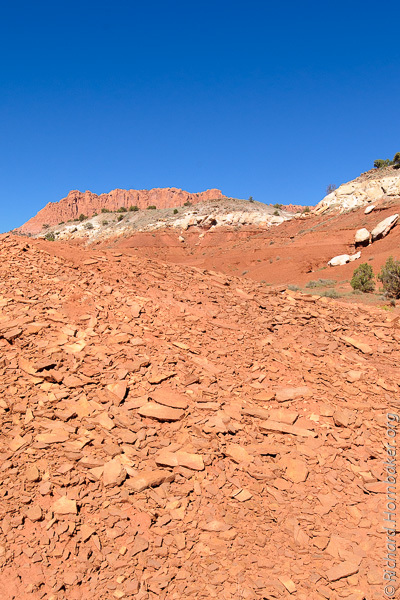 Here’s a view into one area of the Bryce Amphitheater and its army of “hoodoo”, or stone towers. 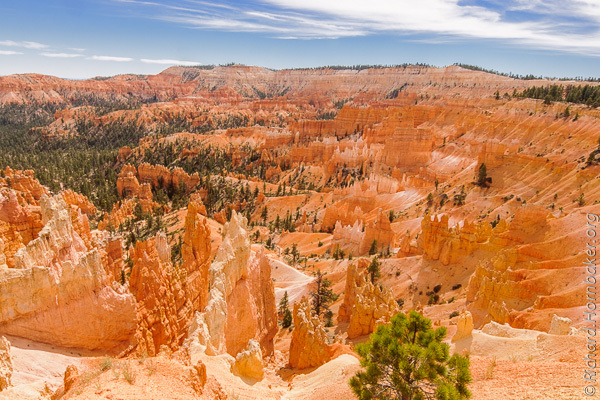 There were hints of the hoodoo in Red Canyon, but they’re super-concentrated here in Bryce Canyon. 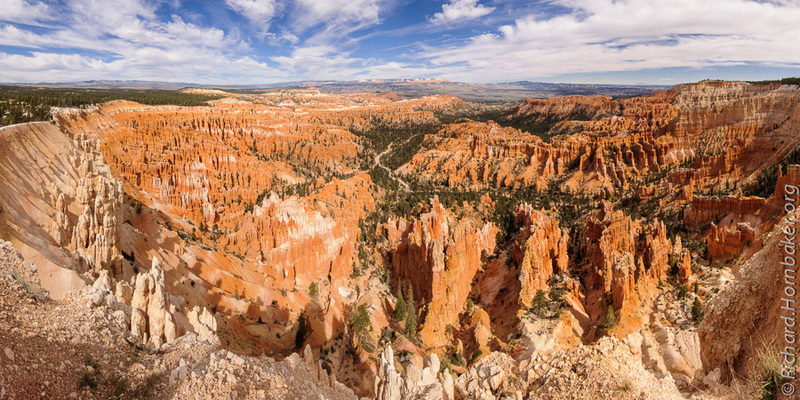 Bryce Canyon has several viewing areas, with various angles on the amphitheater and surrounding valleys. It also has several hiking trails that take you down amongst the hoodoo, but then you can’t see the forest for the trees. The next morning our plan was to follow the sun. The North-East end of the park would get the earliest light, while the South end would get the last light of the day. 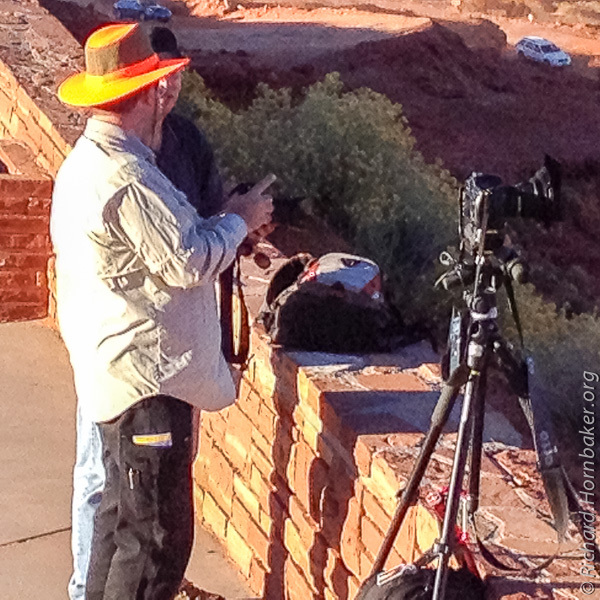 Our first stop was about 45 minutes before dawn, near a hill called Checkerboard Mesa. This hill and an adjacent cliff would be the first point of interest to be lit by the sunrise. There was an observation area with parking, but as typical you couldn’t see the whole panorama from one point without trees obscuring the view. Solution: get to higher ground. Across from the observation area was a small hill that had been carved out for the road. That gained about 30 feet of elevation so we were now looking over the tops of the trees. In the uncropped version of the panorama (see below), you can see how the elevation made a difference compared to the parking lot below. It was a brisk 27 degrees as we started our setup, with a breeze and no sun. I’d remembered a heavy coat and hat, but managed to leave my gloves in the hotel; the sun couldn’t come up fast enough! For the image above, I shot with a 24-70mm at about 30mm. I used the same 6″x7″ GND filters I’d bought for the wide-angle lens, adding an adapter to attach it to the 77mm filter ring on this lens. However, what I didn’t think through is the fact that on a longer lens a much smaller section of the filter would be used, making the soft edge of the GND much softer. Plus the design of Lee’s adapter is a little odd – it’s well made, but designed to pop off the lens a little too easily. 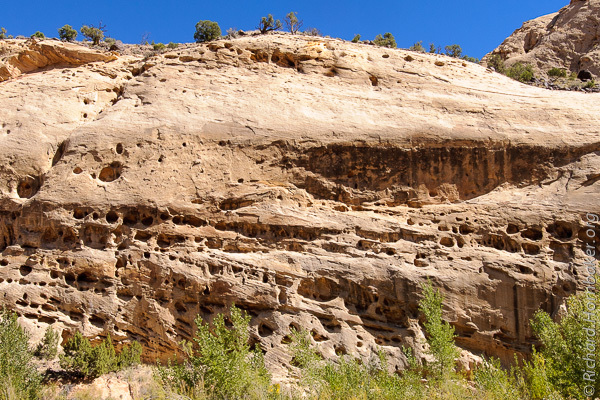 This is a a shot of the Checkerboard Mesa from later in the day, and you can better see the unusual cross-hatch texture that gives it its name. Truth be told, I probably should have shot the panorama image above a little later to expose this detail, but in my mind’s eye it wasn’t the main subject of the panorama so I didn’t give it as much consideration as I should have. Further into the park was a small tunnel that I was able to shoot during a short break in the traffic. And some really interesting patterns in the stone. I shot this one thinking it might make an interesting abstract, or desktop wallpaper. A little later in the day would have yielded a bit more definition via shadows. Further in, we came across some wildlife grazing. In the center of the park, just outside the long tunnel is a wide panorama (the tunnel is behind me here). 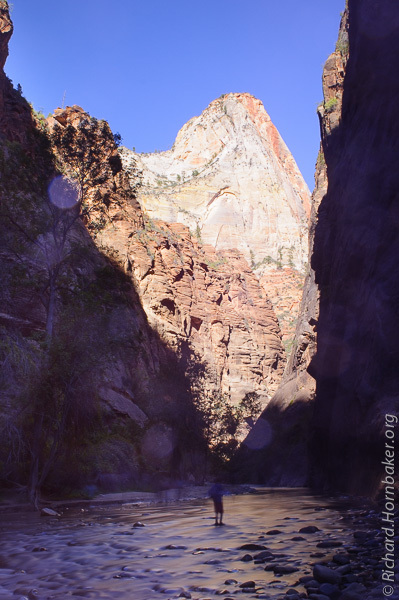 Next, we hiked to an area known as the Narrows, an upper section of the Virgin River where the cliffs are vertical and, well, narrow. This Northern area of the main park is only accessible by shuttle, which runs about every 5 minutes. The hike from the shuttle stop is about a mile along a paved path. These photos were part of an experiment. (That’s my story, and I’m sticking to it.) The photo on the left was taken without filters. The one on the right was a test with two filters. One filter was a 0.6 (2-stop) hard-edge GND diagonally lined up with the shadow line on the left, to make the right side of the image darker, allowing the overall exposure to be increased to expose the shadows on the left. The other filter was a Hitech-Formatt 10-stop neutral-density filter. It did what it should by extending the exposure time 1000x, turning a 1/30-second image into a 30-second image, which blurs the flowing water. However, the filter also adds a strong color cast that’s proven difficult to correct. It also has a real issue with even the smallest of reflections in the lens. That filter’s going to take a bit more work to be useful. At the end of the day, we camped out early to capture the sunset. Our vantage point was a bridge at the South end of the park, with an exciting wrinkle – the bridge was plenty wide, but had no sidewalk. We had to stay close to the edge and watch our backs; buses came pretty close more than a couple times. I intended a few things for this pano that didn’t quite come off – first, I shot it for HDR, but I didn’t like the results (so what you see here is from 6 single exposures). Second, I was hoping for more of an orange glow – this didn’t happen until the last 10 minutes of sunset, when the shadows had swallowed everything except the far peak. And third, I’d composed for a taller shot to capture more of the stream in the foreground, but had to crop it out because there was too much clutter on the sides (e.g., capturing the edge of the bridge, people standing, parked cars, etc. ); this was due to shooting from the bridge. For a bit of technical discussion, here’s the uncropped version of the image above, which gives a better idea of how the shots were taken. 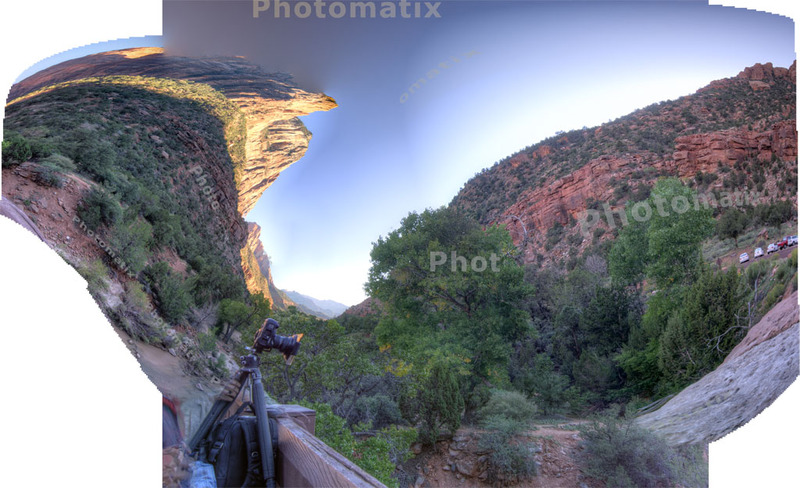 This panorama is comprised of 14 images, and then cropped to a 6:1 ratio (which is 4x wider than a typical photo). That’s a pretty skinny panorama; usually I strive for a 3:1 ratio. Something that’s not obvious is that these images were all shot in portrait orientation – i.e., camera vertical. This takes a lot more shots to compose the final image, but it leaves you with many more pixels for a large print. This final image is 20,000 pixels wide, which means it could be printed 7 feet wide at 240 pixels per inch – you could put your nose on the print and still not see pixels. However, it does make for big files – this one’s over 300MB. A few comments on my technique for panoramas… Focus is set on the main subject using spot-focus, then switched to manual. Exposure is always Manual mode; the aperture is fixed at f/11 or f/16 for most of the shots on this trip for deeper depth of field, and shutter speed is adjusted to control the exposure. ISO is set to the native value for my camera (ISO200). I also have the camera set for 14-bit capture (instead of 12-bit), which yields a little more dynamic range. 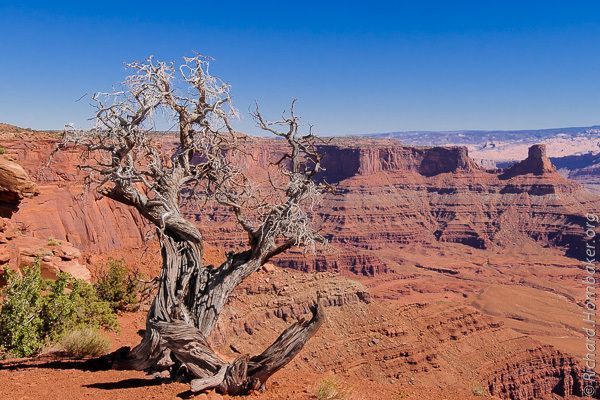 No HDR bracketing was done for this image – just one shot per frame. Exposure was set so the brightest point in the frame (the cliff face) was just barely warning about blown highlights in my camera’s LCD preview – this yields the most detail form the shadows without losing the highlight detail. 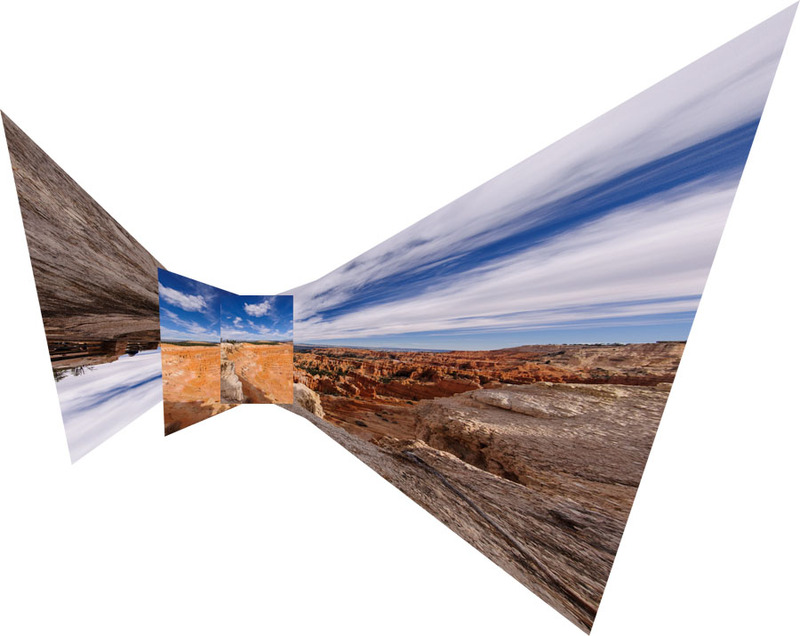 The challenge with printing panoramas is that many shops don’t offer the shape you need, or they charge a premium. 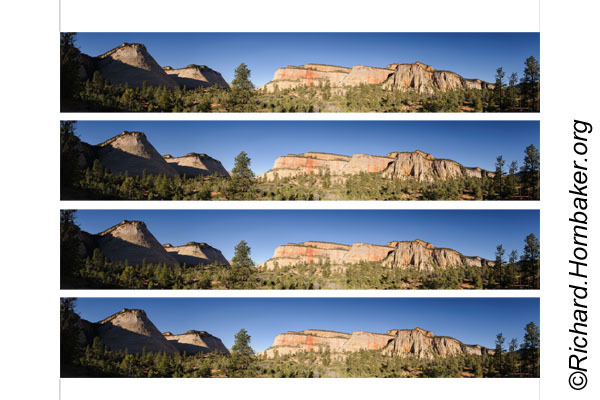 My solution is to layout multiples of the same panorama in a single file, then trim them to size myself. Your local FedEx Office (Kinko’s) has roller cutters in their public area that can trim up to 48″ sheets. Image | Mode | 8 bits/channel – to support the JPEG file format. Edit | Convert to Profile | sRGB – all printers will work with sRGB; if I have a printer-specific ICC profile, I’d select it here instead. The reason this photo doesn’t go edge-to-edge on the print above… the large-format printer I use has a 1/4″ white border around the sheet, and I want my image printed to the edge without having to trim the 1/4″ edge and yielding an odd-sized print. So, instead of printing three 5″x30″ images on a print, I’ll do four 4″x24″ images. And a finishing touch… when trimming the prints, they get handled a lot; I wear gloves to keep fingerprints off the photo. Latex would probably work, but I use cheap cotton inspection gloves from Grainger. And just to show that things don’t always work smoothly, here’s Photoshop’s attempt at stitching a 6-frame panorama that had been processed through a trial copy of Photomatix first. Although the same HDR settings were used on all the images, there was apparently a lot of difficulty in auto-aligning them – this looks like something from the Star Trek episode where the transporter was malfunctioning. 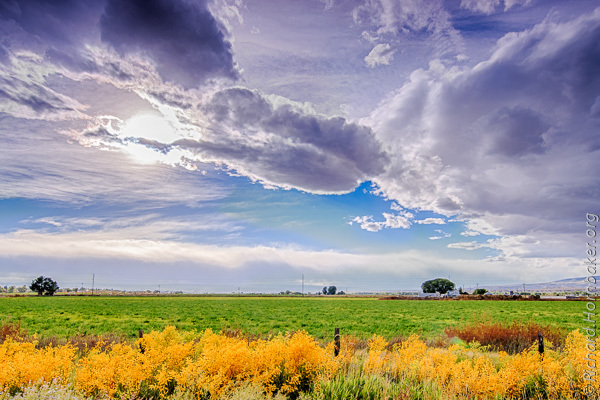 I’m a slow adopter of HDR, and this was a trial at doing both HDR and panorama stitching by first processing the images in HDR and then stitching them. PTgui does both at once, but I don’t like the look of its HDR; I have Nik’s HDR Efex Pro 2 as part of the Nik Collection, but at least their presets disagree with my tastes as well. So far, I’m liking the look of a couple Photomatix presets (e.g., Smooth 2), but I clearly have some kinks to work out. Our trek started at 7:00am in Phoenix, Arizona. 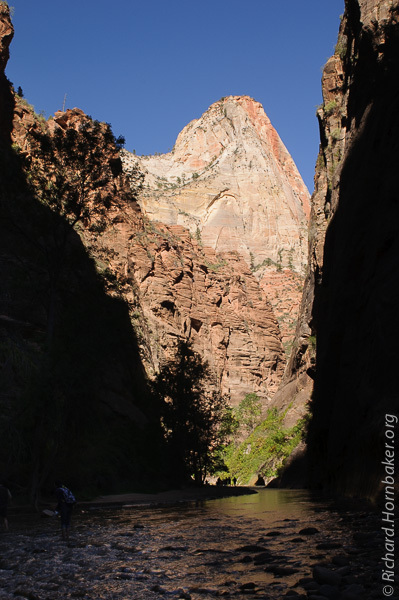 Having already been to the Grand Canyon and the slot canyons in Page, AZ, our first destination was Zion National Park in southern Utah. The weather was fantastic for the drive, and this section of the country has an amazing variety of colorful terrain. 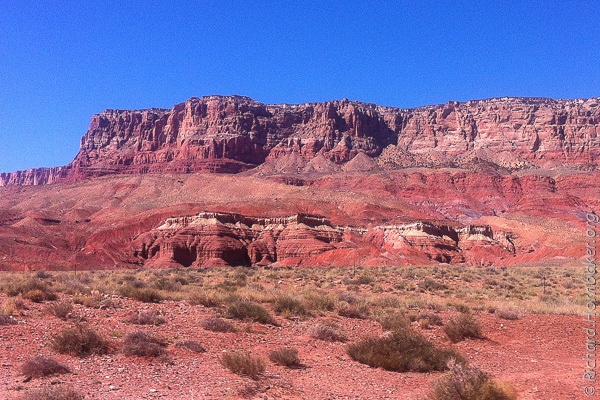 Along the way was the Vermillion Cliffs National Monument, on the northern edge of Arizona just West of Page, AZ. We only made one stop along the way at a vista just inside the Arizona border with Utah. As much as anything, it was an opportunity to give our new 150mm (6-inch!) graduated neutral-density (GND) filters their first run. We’d each bought a set of these jumbo filters and the associated holder for Nikon’s 14-24 lens – because of its shape and field of view, a special filter holder is needed for this lens, along with 150mm x 170mm (6″ x 7″) GND filters. We figured out quickly that it was going to be tough to tote these giant filters, and handling them without smudging or scratching would take patience. While I liked the vista, it doesn’t really make for a great photo – the cliffs are too small in the distance, with humidity muting the colors and contrast. I’d also used a mild “0.3” (1-stop) soft-edge GND filter on the sky, so the effects were more subtle than I like. As the trip progressed, I’d swing to the opposite end of the spectrum and use much darker filters – up to a 1.5 (5-stop) GND, which worked fabulously on storm clouds. 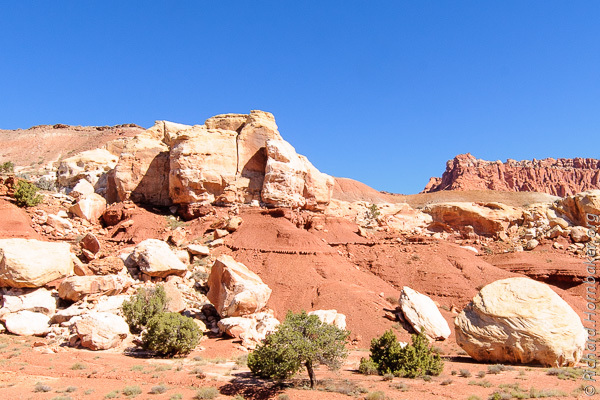 Between Kanab, UT and Zion were some very scenic landscapes. If only these clouds had followed us into Zion! Later, we would gain a strong appreciation for having clouds in the shot – they make a huge difference in the impact of an image. It pains me to say this fantastic shot was taken with an iPhone4, and not my DSLR. 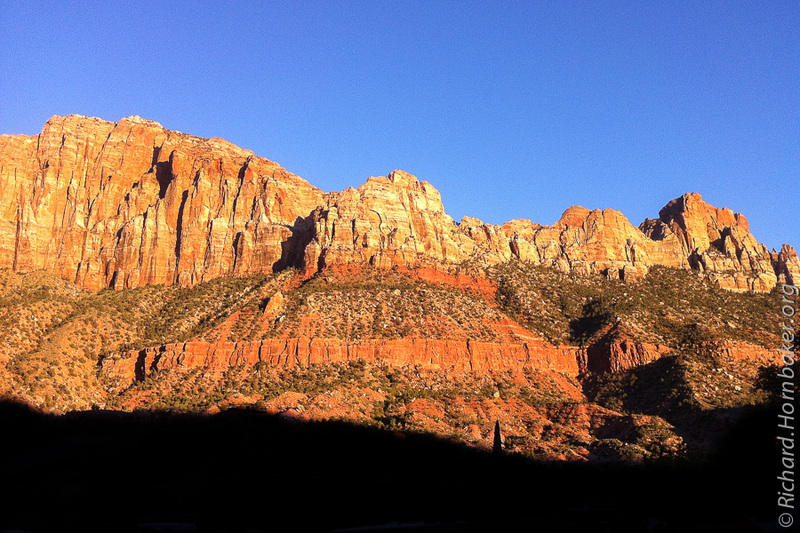 (It’s actually 2 stitched photos, taken while we were driving 65mph.) Not that I’m biased against my phone camera – it’s very handy – but this photo is too grainy for more than web use. I’d been taking snapshots with my iPhone as we drove, to capture interesting scenes for a photo map we could build from the GPS data captured by the phone. This is one case I wish I’d pulled out my DSLR instead. We arrived at Zion around 4:30pm local time, about 8.5 hours after we began. Being late in the day, our priority was to get setup and scout for the following day’s shots. We bought an annual US Parks pass at the entrance and took a drive through the park, taking snapshots from the car along the way – noting what looked interesting, and what time of day would give the best light/shadows. Something that struck me was the contrast in landscapes; it’s like the park has two personalities. At the northeastern entrance, the stone is mostly white with sparse brush; suddenly, it transitions to a dark reddish-brown stone with evergreen trees. 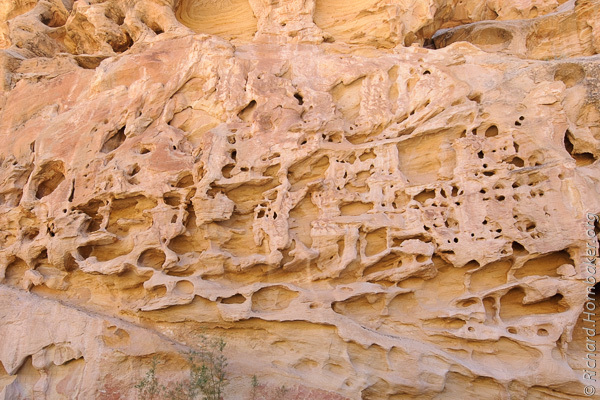 And the strata in the stone isn’t horizontal – it points in all different directions; geologists believe this is because it originated as giant sand dunes that became compressed and infused with minerals. 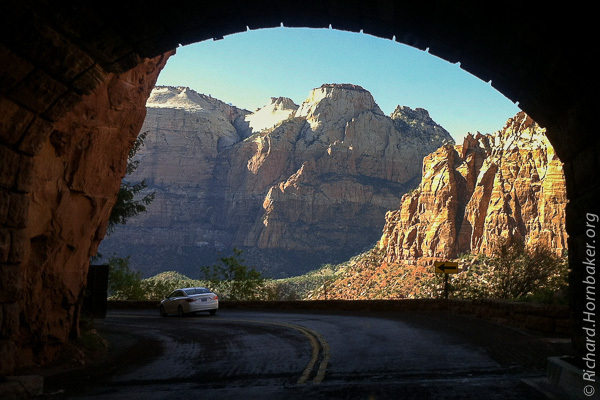 Also impressive is a mile-long tunnel cut through the mountain, allowing the main road to pass through the park. Clearance in the tunnel is so narrow at points that traffic must become one-way anytime an RV-sized vehicle needs to pass (which is pretty frequent).